The weather is warm, the sun is high and the road is calling — it’s time to get those summer vacations planned! Summer is our favorite season for traveling in Nebraska for a number of reasons, but especially for the bountiful outdoor opportunities. We rounded up the best summer getaways in the state, all of which include easy access to the great outdoors. Whether you’re looking for a vintage riverboat, a luxury glamping experience, or a cozy bed and breakfast, you are bound to find something on this list that strikes your fancy. Happy travels! Looking to get out of the state? Don’t miss our guides to nearby road trip destinations from Omaha and Lincoln. Located in Rural Cass County, Slattery Vintage Estates offers a romantic glamping experience in a vineyard setting from May 1 to November 1. 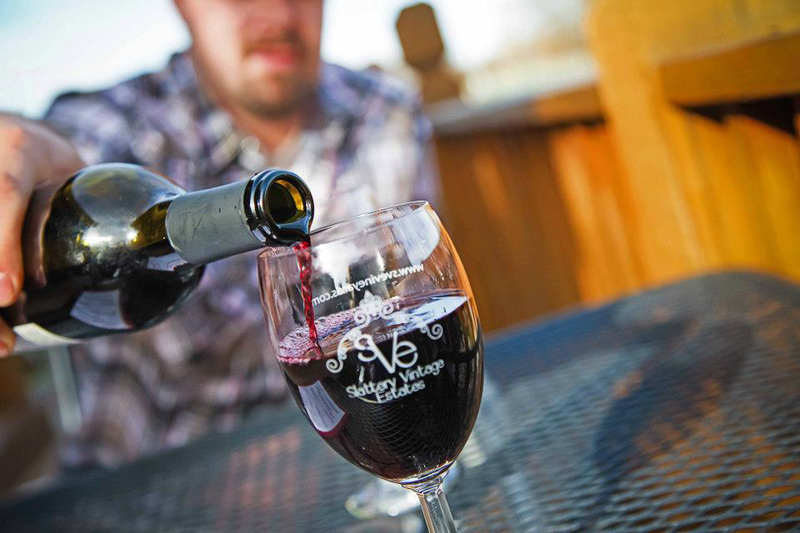 By day, wander through the vines, learn about your favorite varietals, or travel to the nearby towns. Then by night, retire to your cozy canvas tent, complete with a porch for looking at the stars, romantic twinkle lights and a campfire site. Each accommodation comes furnished with a full or queen-sized bed, a dresser, a rug and more. And, you’re invited to come inside the tasting room for a gourmet breakfast in the morning as well as 50 wines and craft beers from Nebraska and around the world. Rates start at $60 per night on weekdays, and $90 per night on weekends. Call 402-267-5267 to make a reservation. Heartland Elk Guest Ranch is open year-round — in fact, it landed on our list of the most romantic winter getaways in Nebraska — but summer is peak time to visit! During the warmer months, guests have full access to the gently winding Niobrara River, which offers plenty of opportunities for tubing, canoeing and kayaking. You can rent everything you need for your water adventures on site at the outfitter’s cabin! 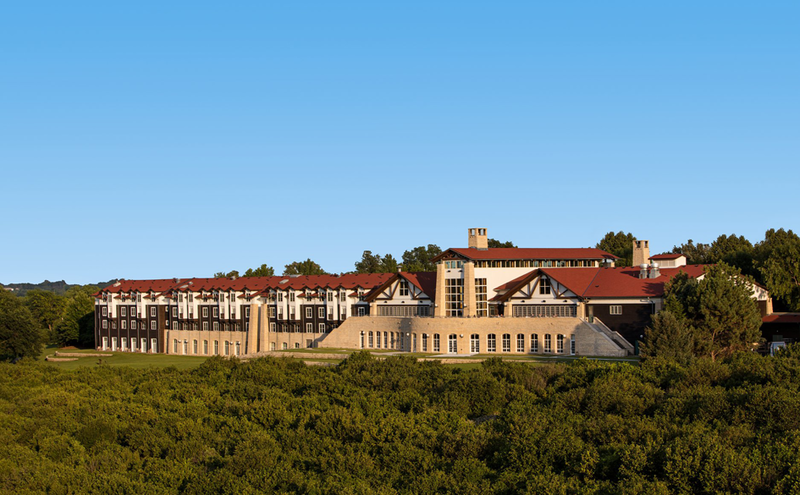 Additionally, you’ll be able to enjoy hiking to nearby waterfalls and breathtaking panoramas of the rolling hills — the lodge truly is a gateway to a beautiful outdoor landscape in Nebraska. Once your day of adventuring has come to a close, retire to your private cabin. Each comes equipped with a full kitchen, air conditioning, cozy bedding and full bathrooms. Rates start at $135 per night. Call 402-376-2553 to make a reservation. What better place to relax in the summer than by the water? The River Inn Resort is a charming boutique hotel that floats on the tranquil Missouri River, so it’s about as close to the water as you can get. Enjoy picturesque views of the river valley and the nearby attractions in historic Brownville, which include delicious restaurants, informative museums, art galleries and shops! While you’re here, don’t miss the opportunity to take a dinner cruise aboard the Spirit of Brownville, which sails Fridays, Saturdays and Sundays during the summer. Rates start at $120 per night. Call 402-825-6441 or click here to make a reservation. For adventurous families (or those simply looking for a luxe retreat), opt for the Middle Loup River Ranch Guest House. During the summer months, guests can enjoy fishing, canoeing, kayaking and hiking along the river. And after the sun sets, relax on the screened-in porch telling stories and catching up with the family. The house is completely stocked with a library of movies and an assortment of puzzles, books and board games. Rates start at $99. Call 308-645-2715 for availability. Couples, families and friend groups alike will love this private, outdoorsy escape. The Niobrara River Ranch Cabins are situated near Valentine, Nebraska, and each of the seven different private lodges is equipped with air conditioning, wood stoves, a tub and shower, and a full kitchen. But though the cabins themselves are luxe, they offer easy access to Nebraska’s wild side. A wide variety of outdoor activities, including canoeing, hiking, fishing, tubing and kayaking await just outside the door. Cabin rates start at $275. Call 402-890-1245 for availability and to make a reservation. The guest book at Beaver Crossing Country Cabin is filled from cover to cover with absolutely glowing reviews — and once you step on the property, you’ll understand why. The lodge is within easy reach of Omaha and Lincoln, and is equipped with everything you need for a fun and serene country getaway with friends and family. Enjoy breathtaking sunrises that light up the country landscape, warm hospitality, and bountiful opportunities for stargazing, picnicking, bird watching, hunting, hiking and more! $200 per night for two people ($25 for each additional person). Call 402-532-7500 to make a reservation. Located midway between Lincoln and Omaha, his state park is the perfect destination for a summer getaway with the whole family. Explore the park’s abundant hiking and biking trails, climb the iconic observation tower, and play in the aquatic center. For lodging, stay at Peter Kiewit Lodge, which offers 40 guest rooms with private balconies and stunning views of the Platte River Valley. Call 403-944-2523 to make a reservation. Believe it or not, beach vacations DO exist in the heard of Nebraska. Dive into Lake McConaughy, which offers ample opportunities for fishing, swimming, boating and other water sports — even surfing! When not splashing in the waves, visitors can enjoy sunbathing on the beach, hiking the nearby trails, visiting historical attractions or roasting marshmallows over a campfire. There are lots of places to set up camp, but if you’d like a roof over your heads, we recommend Eagle Canyon Hideaway. The Lodge comes with a swimming pool, a delicious restaurant, and kind staff that aim to make your vacation as memorable as can be. Call 308-287-2673 to make a reservation. Located on the grounds of Nebraska City’s famed Arbor Day Farm, the fully renovated Lied Lodge welcomes thousands of visitors from around the world each year. Guests can enjoy luxurious amenities in each room, an onsite restaurant, a gigantic indoor pool, a full-service spa, and fantastic views from every angle! The summer attractions at Arbor Day Farm include hikes, a 50-foot treehouse, a train ride offering an up-close at nature, a historical park, fireside s’mores at night, wine and cheese tours, and more. During this season, the orchards are lush and green, and filled with peaches. Rates start at $109 per night. Call 402-873-8733 or click here to make a reservation. Located in the heart of Nebraska City, Whispering Pines Bed and Breakfast offers guests an old Victorian atmosphere alongside modern comforts. The building is surrounded by picturesque gardens and lush greenery — perfect for a lazy afternoon walk! Each of the five rooms offers a different theme, and is furnished with cozy bedding, a private bathroom and plush robes for relaxing. After enjoying an amazing night of sleep, head downstairs and enjoy the homemade breakfast, which could include items like orange pecan french toast or peach enchiladas — yum! Rates start at $171. Call 330-735-2824 for availability or to make a reservation. The Westview Bed and Breakfast is a historic landmark dating back to 1871, and though the guest rooms have been outfitted with luxurious modern comforts (think: two-person whirlpool tubs), the space hasn’t lost any of its antique charm. The lodge sits just eight minutes from downtown Lincoln, but feels like it’s worlds away. You’ll have access to the best of Lincoln dining and nightlife, with plenty opportunities for wildlife viewing and soaking in the Nebraska sun. Rates start at $99 per night. Call 402-470-6000 to book! Do you have any travel recommendations? Share your favorite local getaways with us in the comments.